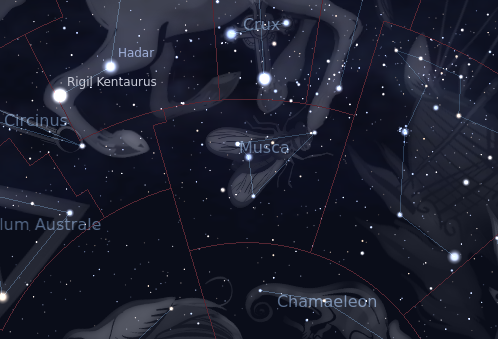 The constellation Musca. Roll mouse over to see labels. Musca is a small southern constellation, which lies immediately south of Crux, the southern cross. It is circumpolar across much of the southern hemisphere, but appears highest in the midnight sky in the months around March. Representing a fly, it is among the twelve constellations introduced by Pieter Dirkszoon Keyser and Frederick de Houtman to represent animals, which first appeared on star maps in 1598. The body of the fly is depicted by second and third magnitude stars lying within the plane of the Milky Way. Musca is home to the globular clusters NGC 4833 and NGC 4372, which are assigned catalogue numbers C 105 and C 108 respectively in the Caldwell catalogue. Musca contains the following Caldwell objects: C105, C108. 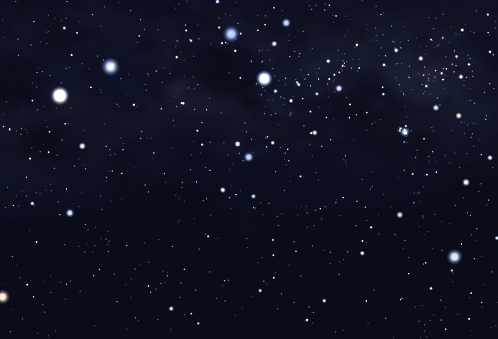 The following constellations neighbor Musca: Apus, Carina, Centaurus, Chamaeleon, Circinus, Crux.